Regardless of the the size or shape of your business, Just Solutions can help you choose the VoIP system that best suits your unique needs and budget. With industry-leading VoIP phone solutions from partners like Allworx, Cisco, and Polycom, you can count on our team to help you decide on the most cost-effective solution. 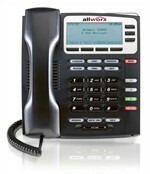 Unlike many competitors' systems, Allworx gives you the luxury of choice in telephone technology. Our systems support both analog and VoIP phones — in any combination. That means you can adapt new technology all at once or build up gradually. Either way, you have entered into the world of effortless communication. Innovation, Value, Reliability, Customer Focus, and Quality. The result is that a rare and unique combination of products meets your needs today and tomorrow, works every day without interruption, has capabilities beyond others, lasts for generations, and provides cost savings from the very first day. Allworx makes it effortless to communicate. That’s why Allworx is the right choice for your business. Allworx gives you the largest set of traditional telephone capabilities of any VoIP solution in its class! Mobility in so many ways — from remote phones to Advanced Multi-site serving up to 99 other locations, to Reach™, a SIP based mobile phone application, Allworx gives you many ways to connect remote locations or employees together. Features as required — powerful features like Automatic Call Distribution, Advanced Multi-Site, Call Assistant™, Conference Center, Reach™, Interact™ and TAPI are activated easily via software keys … add them as you need them. Your total cost of ownership promises to be less than any other fully-featured VoIP communication system. Lowest expansion cost — with no need for gateways, expansion cards or other third-party products. Sensibly priced options — software options are priced so they won’t break the bank or incur recurring monthly or annual maintenance charges. Know your long term costs — Allworx pricing is straightforward and uncomplicated. Optional extended hardware warranties and/or software upgrade keys are available for every budget. Allworx has delivered for over 10 years by maintaining our product line, including ongoing support for the first product we ever built. We design our products to balance these capabilities with your need for simplicity. Features that match our customers — from schools to real estate to health care, Allworx continues to listen and consistently develop new features that exceed every need. 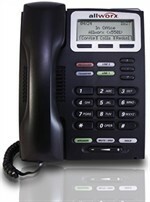 Allworx gives you the luxury of choice in telephone technology. Our systems supports both analog and VoIP phones — in any combination. That means you can adapt new technology all at once, or build up gradually. Either way, you're implementing the solution at your own pace, without compromising. The Allworx 48x is the largest and most powerful of any Allworx system to date – supporting up to 250 users per system. Its two T1/PRI interfaces make it the perfect solution for businesses, but not so large that they need the significant expense of an enterprise-class solution. The Allworx 6x system integrates feature-rich phone system and a robust data network system with advanced features that substantially improve your company’s productivity while saving you on-going monthly costs. The Allworx 6x12 delivers powerful all-in-one communications with feature-rich capabilities, in one integrated, low-cost package. Specifically designed for offices with up to 12 employees, this system combines advanced features — like remote IP phones that can connect from anywhere — with the reliability of true key system operation. Increase the power of your Allworx 48x, 6x and 24x Systems with the cost-effective Allworx Px 6/2 Expander. Use up to three Expanders simultaneously to add more FXO ports and FXS ports to your 48, 6x or 24x system. Completely seamless call processing experience with true unification across all sites. A robust system allowing you to distribute queued calls in linear priority, round robin, longest idle and ring all styles. Live answer position allows operators to easily manage incoming calls via a software tool. Allows you to host conference calls with remote colleagues, internal employees, customers and business partners. Provides voice prompts in two of the three offered languages (English, Castilian Spanish, and French Canadian). Allworx Reach™ combines effortless communications with complete mobility. Whether your smartphone or tablet is Apple or Android, Reach brings the rich functionality of your Allworx phone to your smartphone. Both Wi-Fi and cellular data networks are utilized for Allworx Reach access, so anywhere there is a signal — from across the room or across the globe — you are connected. The Allworx TAPI TSP (Telephony Service Provider) Driver transforms your Windows-based PC into a communications powerhouse. Allworx Interact allows total control over your Allworx phone from your Windows-based PC. From Interact to Interact Pro to Interact Supervisor, there is an application to suit every need.